It was clear tonight! My new motorized focuser arrived last week, so I got to try it out tonight. It works great! The little motor doesn't make the scope wobble like it does when I focus by hand. Here is one of my two targets tonight. I'll post the other one tomorrow since I need to head to bed. 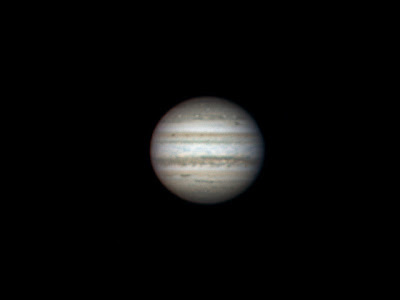 I think I skipped a processing step with Jupiter; it looks a little over-sharpened.